Todays topic focuses on a recently-asked question about flu season prevention tips and Chinese herbal recommendations. Influenza is an exterior pathogen that is carried thru the wind and enters either thru the skin (wind-cold) or the nose and mouth (wind-heat). Wind-Cold enters thru the skin and impairs the function of the lung and affects the nose, causing nasal obstruction and discharge. Yang (the body’s warm energy) is most likely to be damaged and this is characterized by symptoms such as chills, fever, headache, no sweat, and soreness and pain of the limbs, as well as a white tongue coating and fast pulse. Wind-Heat attacks the body through the nose and mouth. The Lung is involved first. Wind-Heat is yang (hot) in nature. When a fight goes on between wind-heat and the body’s immune system, fever, slight aversion to wind and sweating result. When wind-heat attacks the head, symptoms like pain and a pressure sensation occur in the head. When it attacks the Lung, a cough can develop with yellow, thick sputum. Other symptoms include congestion, sore throat with thirst, a white or yellowish tongue coating, and a rapid pulse. Heat maladies can enter in the winter months and show in the summer, when the heat from the environment brings it to the surface. One of the best ways to deal is through prevention. Increase your Wei Qi immune defense: Qi Gong, meditation, yoga, and relaxing exercises increase your immune system so if a virus tries to invade you have a strong response to it. The stronger your body’s defense the better equipped it is to deal with any pathogen. Note- the stronger your defense the more intense the malady will feel as it fights the pathogen. When the pathogen gets expelled it does not lie dormant waiting for another chance to attack. Think of creating your body to be a ninja defender. Ankle and wrist rolls help your body by waking up Yuan source points which help all internal organs. The stronger they are, the stronger your body is. Wash hands after being in public and do not put unclean fingers in nose or mouth area during winter. Maladies can enter thru nose and mouth so best to keep the areas free of disease. Cough and cover with the crook of the elbow to stop the spread. Wear a scarf and cover up the wind gates that exist around the back of the neck and top of the shoulders. Yu Ping Feng San (Jade Screen Powder) to help your immune system so take if you are prone to getting illness. They will prevent respiratory tract infection. Avoid exposure to cold and windy environments, wear a scarf around the neck, and do not eat raw, cold, oily, or greasy foods as they will undo the defense the herbs are trying to strengthen. If you do catch cold, move onto next stage. If you get invaded, take steps to fight off the malady at the first sign. Every illness begins with a cold/external pathogen invasion; either the body’s Wei Qi defense system expels it or it enters into internal organs and comes out as a stronger heat pathogen or it lays dormant and lingers waiting for another opportunity to come out and creates chronic illness. Get to a Chinese Medicine practitioner/acupuncturist: there are several heat releasing points that have expelled my cold and flu signs in one treatment!! Who wants to be sick for a week if you can get rid of it sooner?! An easy home remedy for first signs of illness consists of fresh ginger, the white bulb and root of a scallion/green onion and some brown sugar. Make into a tea and drink several times in a day. It’ll help sweat the pathogen out. As well, make a ginger foot soak. Cut up a large handful of fresh ginger and boil for about 10 minutes. Add the hot water to a container and soak your feet until warmth goes up your back near your shoulder blades. This will help expel the pathogen. If you are just catching cold notice if you have sore throat, aches and pains, thirst or no thirst, sweat or no sweat, cough or no cough. There are various Chinese medicine formulas that can help, but knowing the right one to take is smart medicine. For heat invasion take cooling herbs, for cold invasion take warming herbs. I recommend going to a Chinese medicine practitioner to get the best formula for your condition. I will describe some basic formulas here that can be found at most natural food stores (Down to Earth, Whole Foods, etc). These herbs cost about $10-15. If no cough, mild fever, aversion to cold, slight or no sweat, headache, sore throat, and slight thirst there is Yin Qiao (Honeysuckle and Forsythia Powder). This is good for pneumonia, acute respiratory infection, high fever, tonsillitis, swollen lymph nodes, canker sores, viral myocarditis, epidemic encephalitis B, pharyngo-conjunctival fever (adenovirus) and drug-induced dermatitis. It’s one of the most frequently-used formulas for cold and influenza since it treats both the cause and symptoms of viral infection with its antibiotic, analgesic, and anti-inflammatory and anti-fever activities. Avoid oily, greasy, raw, cold, or sour foods while taking this herb. I like a liquid tincture: add an eyedropper’s worth to a glass of water and take at once, then take another dropper worth and add to water and take throughout the day. Take three doses the first day to knock it out. Studies and personal experience show this formula has improvement within 1-2 doses. This is a must-have formula! If mild cough mild fever, and slight thirst there is Sang Ju Yin (Mulberry and Chrysanthemum Powder). It is good for acute bronchitis, tonsillitis, and upper respiratory infections. This is similar to Yin Qiao but has herbs to address cough. **For heat invasion (sweat, sore throat, thirst) not cold invasion (no sweat, body aches, no thirst). If cough secondary to pulmonary infection, caused by heat with/without sputum there is Dun Sou San (Long-Bout Cough Powder). This will clear heat, dissolve phlegm, stop irritability, and stop cough caused from cold or influenza. 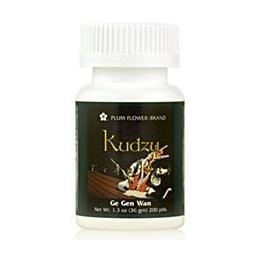 If severe muscle stiffness of neck and back, aversion to cold and wind, fever or no fever, no sweat, possible diarrhea there is Ge Gen Tang (Kudzu Decoction). This is good for fever, common cold, influenza, allergic and chronic rhinitis, upper respiratory tract infection, neck and shoulder pain, arthritis/tendinitis/bursitis of shoulder, facial paralysis, Bell’s Palsy, meningitis, encephalitis, tension headache, urticaria, scleroderma, painful gynecomastia in liver cirrhosis, and diarrhea. Ge Gen Tang has antiviral effect to treat the infection and anti-fever and anti-inflammatory effects to alleviate fever and get rid of muscle aches. If fever, aversion to cold, no sweat, cough and wheezing with profuse clear white watery discharge, chest congestion, heaviness and pain in the body,and possible edema of face and limbs there is Xiao Qing Long Tang (Minor Bluegreen Dragon Decoction). 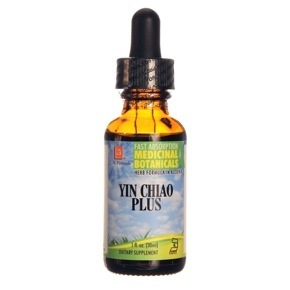 This will help expel the exterior and yin (invisible phlegm) and relieve wheeze and cough. Xiao Qing Long Tang is useful as a prophylaxis as well as treatment for influenza and viral infection as its antiviral effects stimulate and increase production of anti-influenza antibodies. It is helpful for those who live in cold, damp environments. In studies it was shown to relieve patients of pneumonia and asthma within 4-6 doses. It was shown to be 86.7% effective in relieving bronchial asthma when taken three times a day for 1-3 weeks. **It has strong dispersing and heating effects. Do not take for sore throat, yellow sputum, or heat symptoms. Do not take long-term and discontinue when symptoms have resolved. If one has a weakened immune system and has cold and flu signs: wind cold with fever, aversion to cold, headache, neck stiffness, joint pain, body ache, sweat, nasal congestion, cough with sputum, hoarse voice, respiratory tract infection, swollen glands, and chest congestion there is Bai Du San (Overcome Pathogenic Influences Powder/Ginseng and Mint Formula). This will release the exterior wind, cold, and damp pathogens and help build your immune system. It is more for wind cold invasion with aches and stiffness than cough and phlegm. It is also good for urticaria, eczema, rheumatism, dizziness, and acute viral hepatitis. **Good for children, elderly, post-partum nursing mothers. If weak immune system with phlegm and strong cough there is Shen Su Yin (Ginseng and Perilla leaf Decoction). This is for more phlegm and bronchitis signs with white nasal discharge, white sputum, chest congestion than aches/pains. 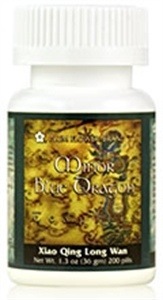 **Good for young children, elderly, and those with qi deficiency and damp accumulation. If one has blood deficiency, yin deficiency (generally has night sweat, heat in palms, soles, and chest, low grade fever, dry throat at night, dry stools and dark urine), or weak immune system from chronic illness or acute blood loss and has wind cold with headache, fever, mild aversion to cold, and no sweat there is Cong Bai Qi Wei Yin (Scallion Decoction with Seven Ingredients). It will help release the pathogen and support the blood and yin. If one has wind cold or influenza with yang deficiency (cold limbs, lassitude, preference for resting, pale face, low voice, pale tongue with thin white coat and deep force less pulse) there is Zai Zao San (Renewal Powder). It will release the exterior pathogen by sweating it out and strengthen the yang. Eat cooling and moistening foods for heat symptoms. Eat warming foods or cold symptoms. Mint and pears are great for heat symptoms. Cinnamon and garlic are great for cold symptoms. Eliminate dairy and sweets until after you are well. Dairy creates phlegm and sweet creates heat- both of which you are trying to eliminate if you have an illness. Mint expels wind heat. It is great for fever, headache, cough, inflamed eye, sore throat, stomach ache, skin boils, and mouth ulcers. Pears help eliminate excess mucous and the cooling nature eliminates heat. They are great with moistening dryness associated with heat, dry throat, and hoarse voice. Super great to eat in the fall season to ready your body. Cinnamon is very warming to the body and as well helps warm the kidneys which help our immune system. Ginger is one of the most warming foods and is also great for upset stomachs. Garlic is warming and has antiviral and anti-bacterial properties. Mash or blend the following ingredient and drink or eat 3-6 times per day. Cooling fruits: Eat watermelon, mandarins or oranges throughout the day. Eggs: Break a fresh egg into a deep bowl and lightly beat egg. Add hot water, some sugar and a few drops of olive oil. Drink every morning for 3-7 days. For hot syndromes. Remember to remove the bay leaves and ginger before serving. Above all else, get plenty of rest and drink lots of fluids.